It was the tennis match of the Century. A loud-mouthed ex men’s champion challenged the, then, current women’s number one to a game of tennis. 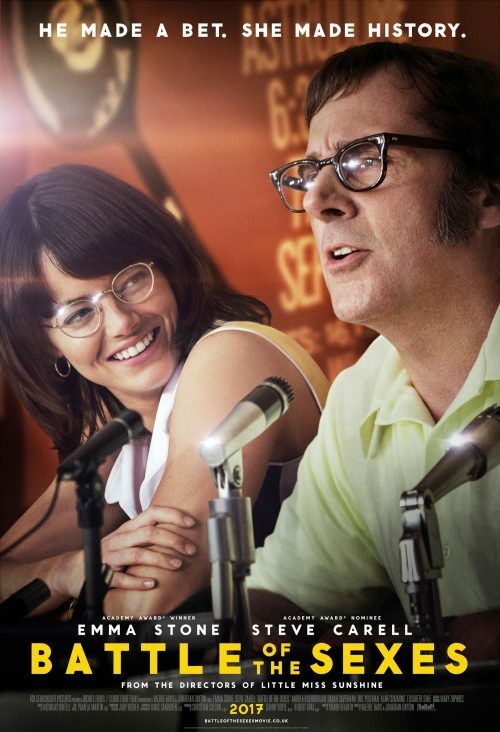 It didn’t go as planned as Bobby Riggs… You’ll just have to watch the film to find out the ending. Today, we have been sent over the first poster for the upcoming film based on that great match. Battle of the Sexes. It doesn’t show much apart from Bobby shooting his mouth off with Billy Jean looking on in amusement. In the wake of the sexual revolution and the rise of the women’s movement, the 1973 tennis match between women’s World #1 Billie Jean King and ex-men’s-champ and serial hustler Bobby Riggs was billed as the BATTLE OF THE SEXES and became one of the most watched televised sports events of all time, reaching 90 million viewers around the world. As the rivalry between King and Riggs kicked into high gear, off-court each was fighting more personal and complex battles. The fiercely private King was not only championing for equality, but also struggling to come to terms with her own sexuality, as her friendship with Marilyn Barnett developed. And Riggs, one of the first self-made media-age celebrities, wrestled with his gambling demons, at the expense of his family and wife Priscilla. Together, Billie and Bobby served up a cultural spectacle that resonated far beyond the tennis court, sparking discussions in bedrooms and boardrooms that continue to reverberate today.